3 qt. 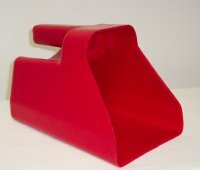 scoop made of durable plastic. Balanced easy grip handle makes it ideal for both liquid and dry products. Currently available in white only.